2018 is going to be an important year for the history of comic book movies because this is the year one of the forefathers of black Comic characters gets his first feature film. February 15th Black Panther premieres so far all the brothers and sisters who don’t know about this jungle cat let’s get you up to speed with Black Panther. Black Panther first appeared in the Fantastic Four #52 in July of 1966. Created like most of Marvel’s greatest characters by Stan Lee and Jack Kirby. The creators wanted to combat the stereotypical and undignified portrayals that had become the norm for comic books at this time. Black Panther would not be some hick farmer or indebted to a white man in any way, instead, he is a ruler of his own African country. One that keeps itself in solitude not because they fear the outside world but because they are so advanced they choose not to participate in it. And the ruler of this country puts on the Black Panther costume and not just leads but fight for his country. And it all ties this together with the Black Panther himself T’Challa. The Black Panther is supposed to be a ruler but T’Challa is also young, his father was killed so he has no previous Black Panther to teach him how to rule his country and he makes mistakes. It’s no wonder why a concept as strong as this would strike a chord with readers, Fantastic Four #52 was extremely successful. It also doesn’t hurt that Black Panther has one of the best looks in comic book history. This costume was instantly iconic and impressive. The simpleness of the black suit with the fantastical design mask that strikes the perfect balance between looking like a panther and not looking ridiculous is a great look. After featuring in Fantastic Four he was moved over to Marvel’s Jungle Action series and this is where the character started to hit his earliest high points. The debut storyline Panthers Rage was not only important for the character it was important for the whole of comic books. Being the first multi-part comic book storyline with the full story being told over a still impressive 13 issues. Panther’s rage was a critical and financial success with the storyline still being praised to this day not only for its innovation but also for its epic scope in a masterful character development. And Marvel wasn’t done there they continue to push the bar with their next being Black Panther versus the Ku Klux Klan which was one of the first times we saw some mainstream comic books openly criticizing the KKK. Dwayne McDuffie himself the black Godfather of Comics talked about these stories as a massive inspiration and even said “This overlooked and underrated classic is arguably the most tightly written multipart superhero epic ever. If you can get your hands on it … sit down and read the whole thing. It’s damn-near flawless, every issue, every scene, a functional, necessary part of the whole.” Even though the jungle action series was very popular with college students the overall sales for the book didn’t justify Marvel keeping it around so it was canceled and replaced by a black issue solo series. Which unfortunately did even worse, the writer/artist Jack Kirby wanted to move on to other projects and his apathy showed with the series being canceled after only 15 issues. After that Black Panther was occasionally revived but mostly relegated to a background player in the Marvel Universe. He never really captured the success of the original Jungle action series. Until 1998 when the loved and controversial writer Christopher Priest took a shot at revitalizing the character. He and artist Mark Texeira breathed new life into the character focusing more on the political side with Christopher Priest being a very politically active man himself. Strangely enough, one of Christopher Priest’s biggest moves is adding a white character to the supporting cast, Everett Ross. Here’s what Mr. Priest had to say about that, “I realized I could use Ross to bridge the gap between the African culture that the Black Panther mythos is steeped in and the predominantly white readership that Marvel sells to.” And it turns out he was right, his run on Black Panther was an unquestionable success. Christopher Priest was the first black writer to have a successful run on this character. With his run lasting up to 2003 and firmly cementing Black Panther as one of the most important characters in Marvel’s whole catalog. Since then Black Panther has been in near constant publication. 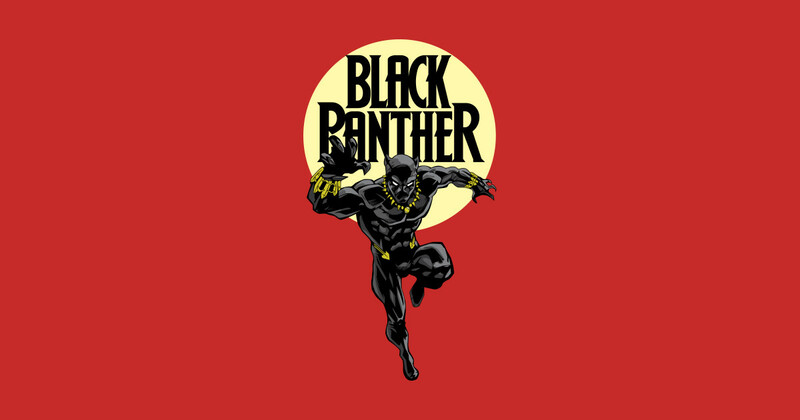 One of the more notable runs since then was “Who is Black Panther” by Reginald Hudlin and John Romita Jr. And yes it is the Reginald Hudlin who used to be the president of BET Network, in fact he later adapted his run of Black Panther into a cartoon series that ran on BET during his time as president. Currently, Marvel is really pushing Black Panther no doubt because of the upcoming movie and put some major talent on the current Black Panther series. They brought in writer Ta-Nehisi Coates who wrote the critically-acclaimed Between the World and Me. This series wants to focus far more on Wakanda as a nation and how it operates than any run before it and brings Ta-Nehisi Coates trademark politically minded and socially relevant storytelling to the forefront. So that’s the Black Panther. The most influential black comic book character of all time. His influence and legacy can be felt throughout every black superhero out therefrom, Luke Cage to Cyborg from Misty Knight to Bumblebee you can thank Black Panther. I for one can’t wait to see this legend be brought to the big screen! NextNeal Arthur; Why He’s Running!